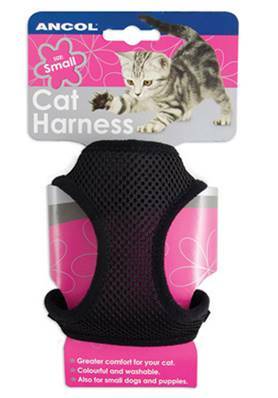 The new Soft Cat Harness with a permanently attached lead is the ultimate in comfort. The greater surface area offers improved support and is easier to put on a struggling cat. Great for small dogs, puppies and even rabbits. Small- for kittens, guinea pigs and small rabbits. Medium- for adult cats, puppies and rabbits. Large- for bigger cats, small dogs and large rabbits.